This new Hubble Space Telescope image of Abell 68 is enhanced by gravitational lensing, showing swarms of galaxies that each have billions of stars and vast amounts of dark matter. The NASA/ESA Hubble Space Telescope is one of the most powerful available to astronomers, but sometimes it too needs a helping hand. This comes in the form of Einstein’s general theory of relativity, which makes galaxy clusters act as natural lenses, amplifying the light coming from very distant galaxies. Abell 68, pictured here in infrared light, is one of these galaxy clusters, and it greatly boosts the power of Hubble, extending the telescope’s ability to observe distant and faint objects . The fuzzy collection of blobs in the middle and upper left of the image is a swarm of galaxies, each with hundreds of billions of stars and vast amounts of dark matter. The effect of this huge concentration of matter is to deform the fabric of spacetime, which in turn distorts the path that light takes when it travels through the cluster. For galaxies that are even further away than the cluster — which is already at the impressive distance of two billion light-years — and which are aligned just right, the effect is to turn galaxies that might otherwise be invisible into ones that can be observed with relative ease. Although the resulting images projected to us of these distant galaxies are typically heavily deformed, this process, called gravitational lensing, is a hugely valuable tool in cosmology, the branch of astronomy which deals with the origins and evolution of the Universe. These distorted images of distant galaxies are a particularly fine example of this phenomenon. In the middle of the image are a large number of galaxies stretched out into almost straight streaks of light that look like shooting stars. Meanwhile, just above and to the right of the large, bright elliptical galaxy in the upper left of the image is a spiral galaxy whose apparent shape has been stretched and mirror-morphed into the shape of an alien from the classic 1970s computer game Space Invaders! A second, less distorted image of the same galaxy appears to the left of the elliptical galaxy. Another striking feature of the image, albeit one unrelated to gravitational lensing, is the galaxy in the top right corner of the image. What appears to be purple liquid dripping from the galaxy is a phenomenon called ram pressure stripping. The gas clouds within the galaxy are being stripped out and heated up as the galaxy passes through a region of denser intergalactic gas. This image comes from the infrared channel of Hubble’s Wide Field Camera 3, combined with near-infrared observations from the Advanced Camera for Surveys. This offers a modest taster of the kind of images that will come from the forthcoming NASA/ESA/CSA James Webb Space Telescope, which is scheduled for launch in 2018. Infrared images are particularly useful for studying very distant objects whose light is redshifted into the infrared by the expansion of the Universe, as well as for peering through dust clouds which are opaque to visible light. The Webb telescope will produce images which are sharper than Hubble’s infrared images, but more importantly, it will be much more sensitive, thanks to its advanced sensors and larger primary mirror. The image is based in part on data spotted by Nick Rose in the Hubble’s Hidden Treasures image processing competition. 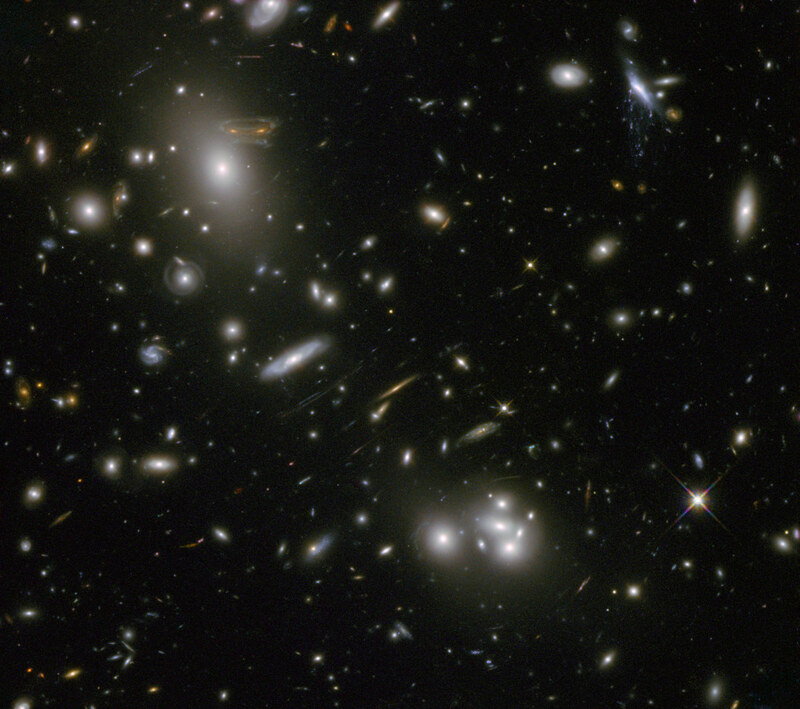 Hubble’s ability to see distant objects will be enhanced with the start of Frontier Fields in the near future, an observing campaign that aims to combine the power of Hubble with the natural gravitational telescopes of high-magnification clusters of galaxies — as seen here with Abell 68. This will enable Hubble to see objects that would ordinarily be too distant or faint for it to see. Frontier Fields will study six different galaxy clusters to give us a sneak preview of the very earliest stars and galaxies, before the launch of the James Webb Space Telescope in 2018. 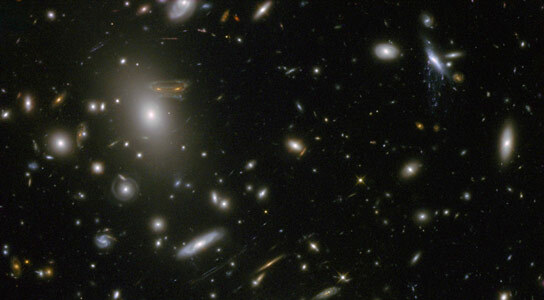 Be the first to comment on "Gravitational Lensing Gives Hubble Image of Abell 68 a Unique Look"